Spring is almost always the time of year when we see the largest numbers of buyers registering to find their next home. And with two long school holiday periods on the horizon - Easter and Summer - family friendly locations like Berkhamsted and Tring see a lot of property market activity. There is no season quite like spring. Moods start to lift from the grey of winter and thoughts begin shift from staying indoors to getting outside: the possibility of enjoying the summer and garden of a new home becomes the conversation at the table. While it's a time of more buyers, it's also a time of more available property, so it's important to give yourself the best chance of capturing people's attention and imagination. 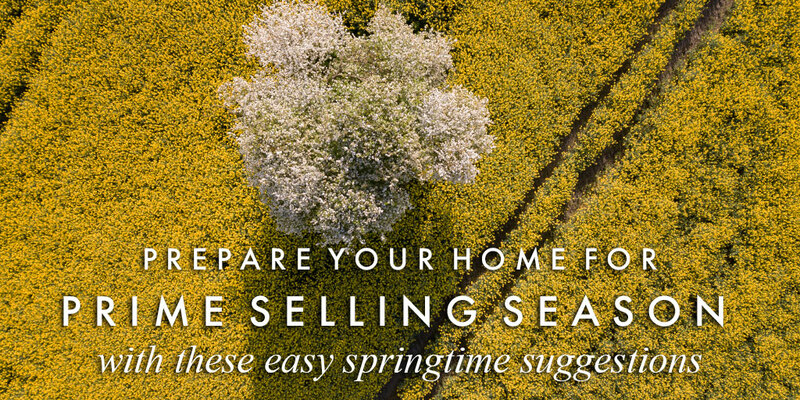 Fortunately, spring is one of the easiest times of year to maximize your chances of a sale without major effort. Here are some suggestions to help you make the most of prime selling season. As winter fades away and colour starts returning to the world, planting the front of your property with flowers like daffodils, tulips and bluebells will bring the spring right to your door. If you don't have permanent beds, invest in a large pot or two for instant kerb appeal - you'll be amazed at the difference this small change will make, both to the photos of your home and to the first impressions of arriving viewers. Go one step further with a vase of fresh flowers inside - a hallway console or dining room table are perfect locations. It may be a cliché, but cleaning out your cupboards, closets, clothing and clutter will give your property a palpable sense of order and space which is great to live in while you're on the market, and great to visit for potential buyers. A large and well-stocked bowl of colourful fruit on the coffee table or kitchen worktop adds an immediate centrepiece that has the additional benefit of being as edible as it looks. A dark-painted room that might feel cosy in winter might come across as gloomy in the spring. At this time of year people are looking at natural light, so consider whether painting any of your rooms could give them a lift and improve their chances. The longer nights of winter make soft interior lighting a must, but for spring it's time to polish windows and mirrors to show off the bright and breezy qualities of your home. Crisp sunny days are eminently possible in spring, as are wet and windy ones. So plan for every eventuality with places for viewers to wipe their feet, leave their shoes, hang their coats and deposit umbrellas. Have you found these tips and ideas useful? As ever, if you have any questions about any aspect of moving home, we'd love to talk to you.